"Get it now though using our handy guide"
AlphaJax is an award-winning, must-have free word game that allows you to compete against friends and strangers alike, all you need is a love of words and some interwebs. 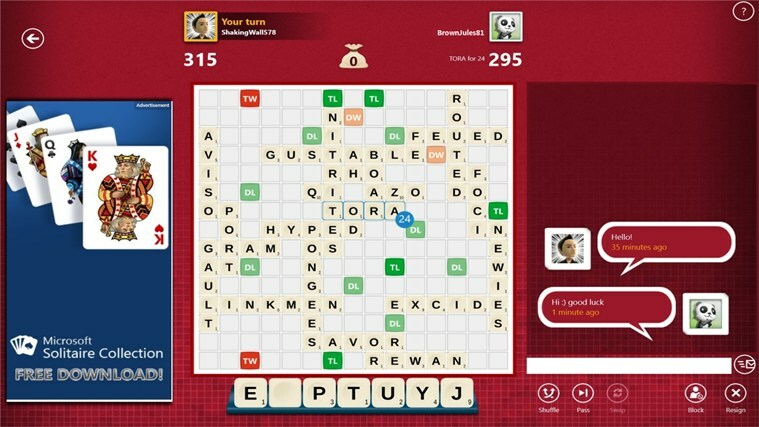 Take turns using your tiles to create words on the board, attempting to score the highest points. Play cross-platform with users on both Windows 8 and Windows Phone. Create games with players from around the world, or call out for a game to your friends. In a hurry? Pass and play with a friend or hone your skills by playing against yourself. Earn Xbox achievements and compete against friends for the top position in the leaderboard. Enjoy a skill match? The AlphaJax rating system provides lasting achievement as you progress up the leaderboards and means you are always guaranteed an enjoyable and challenging game. Microsoft appears to have done a complete U-Turn on it's Digital Rights Management (DRM) Policies regarding used games, online checks and region locking. It was quite apparent after the company's Press Conference that revealed the Xbox One to the masses as well as E3 that gamers weren't happy at some of the policies that Microsoft was bringing to the Xbox One. Mandatory 24-hour online checks, region-locking consoles/games and the biggest qualm - the prohibiting of used games/trade-ins. After a one-time system set-up with a new Xbox One, you can play any disc based game without ever connecting online again. There is no 24 hour connection requirement and you can take your Xbox One anywhere you want and play your games, just like on Xbox 360. There will be no limitations to using and sharing games, it will work just as it does today on Xbox 360. In addition to buying a disc from a retailer, you can also download games from Xbox Live on day of release. If you choose to download your games, you will be able to play them offline just like you do today. Xbox One games will be playable on any Xbox One console - there will be no regional restrictions. Whilst this is a majority win scenario for a lot of people, and it's quite clear from some of the reactions seen elsewhere on the web, the news comes at a cost to some of the other features that were bound for the new console, at least for now. The sharing of games will work as it does today, you will simply share the disc. Downloaded titles cannot be shared or resold. Also, similar to today, playing disc based games will require that the disc be in the tray. There is also mention that the Xbox Family Gold Feature that was poised which let you share your Gold membership and Games with 10 other people in your Xbox Family is no longer going to be available at launch - whether this will come at a later date or not remains to be clarified. What are your thoughts on this turn of events?